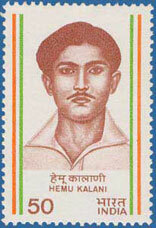 On this date in 1943, the British hanged India independence activist Hemu Kalani in Sukkur for attempting to sabotage a rail line. You could say the Sindh youth was not cowed by the Empire’s suppression of the Quit India movement. It is only by waging unremitting struggle against capitulation in every form, by fighting against dissolution of their own organizations, that they can seriously fight to attain the goal. Intransigent opposition to every capitulationist masquerading as a ‘leftist’! As the British rounded up the Quit India leadership, less conciliatory young people like Kalani came to the fore (pdf) and then were further radicalized by British intransigence. If you’re going to lock up Mr. Nonviolence himself, Mahatma Gandhi, you’re going to get to deal instead with the elements he keeps in check. That was certainly Gandhi’s argument: he refused to condemn violence, observing that the British themselves had called it up. Mass protests gave way to more aggressive direct action; in Kalani’s case, that meant derailing a train bringing ammunition to the European forces occupying his native province. Caught in the act, he refused under torture to shop his comrade, earning a hemp necktie from the occupiers and the tribute of posterity on the subcontinent. Somewhat ironically, the relative intransigence of Quit India supporters during this period, as compared with the Muslim League‘s greater support for Britain’s immediate World War II exigencies, helped to cleave apart Pakistan and India when independence did come in the late 1940s … which is why the Hindu Kalani is most honored in India, even though his native soil is now in Pakistan.